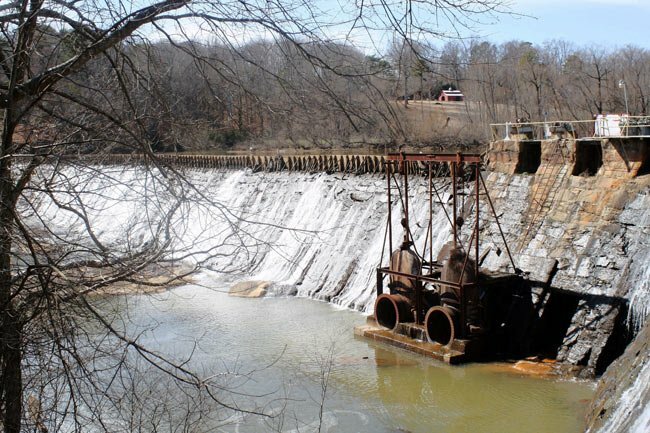 The Ware Shoals Dam was built on the Saluda River in 1906 by Benjamin Riegel, who took over the project from its initiator, Nat Dial. Riegel went on to complete the dam as well as the Ware Shoals Manufacturing Company, which was powered by the dam. Ware Shoals Manufacturing Company eventually became the Riegel Textile Corporation, which sold the power plant to Aquenery, Inc. in 1987. The dam and power plant were upgraded and began selling power to Duke Energy. Though the town no longer boasts a textile mill, it still celebrates its hydroelectric power source and even held a centennial celebration of the dam in 2006. The town is rich in textile history and is the home of Reigel Stadium, home of a former textile-league baseball team.